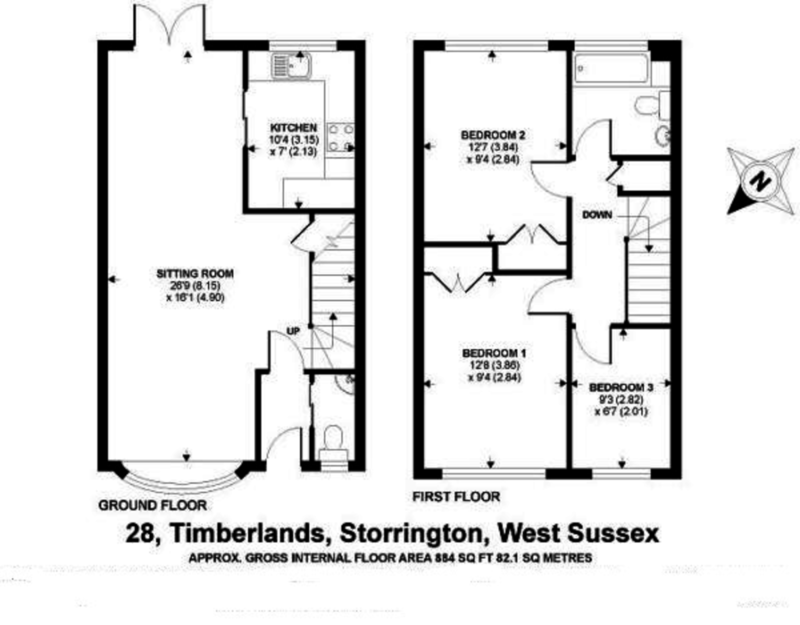 DESCRIPTION Situated in the popular CUL-DE-SAC of Timberlands within a short distance from the village of Storrington, we offer for sale this very well presented three bedroom mid-terrace family home. The property itself comprises: open plan sitting room/dining room with wood flooring, kitchen overlooking the south facing rear garden, with a ground floor cloakroom. Upstairs there are three bedrooms and a family bathroom. The REAR GARDEN IS SECLUDED with rear gated access to the front, with a GARAGE situated close-by in a compound. Early viewing is advised. ENTRANCE HALL Radiator, oak flooring. GROUND FLOOR CLOAKROOM Low level flush w.c., wash hand basin. SITTING ROOM AREA uPVC double glazed Georgian style window bay, radiator, oak flooring, understairs storage cupboard housing gas and electric meters. KITCHEN 10' 4" x 7' 0" (3.15m x 2.13m) Range of wall and base units with stainless steel single drainer sink unit with range of black granite style working surfaces with drawers and cupboards under, space and plumbing for dishwasher and washing machine, space for cooker, free-standing boiler, wall-mounted controls, recessed area suitable for housing fridge/freezer, part tiled walls, double glazed windows. FIRST FLOOR LANDING Access to loft space, covered radiator, shelved linen cupboard housing insulated copper cylinder. BEDROOM ONE 12' 8" x 9' 4" (3.86m x 2.84m) Radiator, uPVC double glazed windows, built-in wardrobe cupboards, TV point. BEDROOM TWO 12' 7" x 9' 4" (3.84m x 2.84m) uPVC double glazed windows, built-in wardrobe cupboards, radiator. BEDROOM THREE 9' 3" x 6' 7" (2.82m x 2.01m) Radiator, uPVC double glazed windows. BATHROOM Re-fitted suite comprising: panelled bath with fitted shower attachment, low level flush w.c., pedestal wash hand basin, tiled flooring, heated chrome towel rail, fully tiled walls, uPVC double glazed window. FRONT GARDEN Pathway to front door, small area of lawn to either side with flower and shrub borders. REAR GARDEN South facing, raised shaped lawned, paved terraced area, rear access, outside water tap.